The annual “Not Your Ordinary Garage Sale,” held by World Wings International, the philanthropic organization of former Pan Am flight attendants, lived up to its name. The event held on Sunday, Feb. 26, at McKinley High School cafeteria, was far from ordinary. A line of eager bargain hunters started forming well before the doors opened at 8 am, Some shoppers made a bee line to the Japanese antiques and kimono, while others headed to the sections with Pan Am memorabilia, jewelry, books and DVDs, clothes, toys, or household items. By the end of the day, most of the merchandise that had been meticulously sorted by World Wings and St. Francis Healthcare System’s team of volunteers the day before, had been sold. 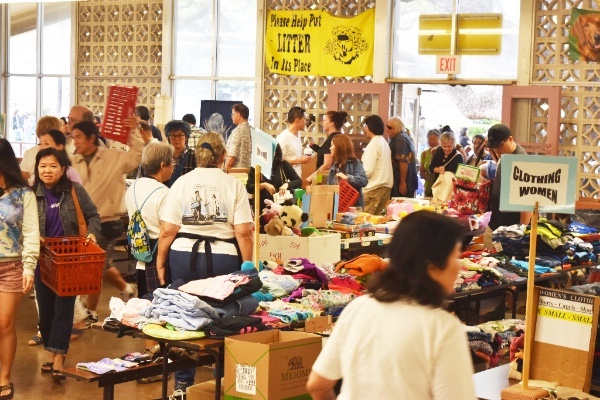 Anything that was not sold was donated to Our Lady of Kea‘au! All proceeds will benefit the St. Francis Hospice’s volunteer program and CARE International. Mahalo to World Wings and to Patty Martin, Vice President – Mission and Organizational Effectiveness and the St. Francis Healthcare System volunteer programs department and volunteers for their hard work. 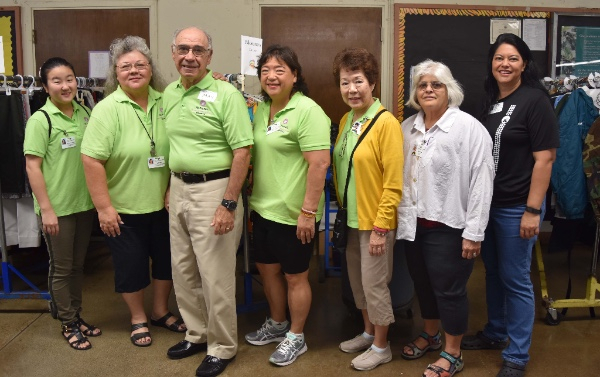 From left, Renni Fay Iwasa, Hospice Volunteer Coordinator; Betty Coffer, Volunteer Coordinator; volunteers Max Glomski, Maylynn Wong, Sandra Kubota, Leina’ala Pilares, and Melissa Ah Ho-Mauga, Vice President – Client Services. Other hard-working volunteers who helped on Saturday included: Rosemarie Daguio, Karyn Daguio, Sadie Coarsey, Joyce Patrick, Margielyn Andres, Carol Ginoza, Roberta Watanabe, Rochelle Nakama, Rita Clare Hall, Ki May Tung, Carleen Dunn, and Jesse Dunn.